Mary Gerrard of the Arbroath Ladies’ Lifeboat Guild was awarded a bar at the Scottish Lifeboat Council’s annual meeting in Perth. This will go with the gold badge she was given by the council in 2011. Mary has been with the Guild since around 1964 after originally joining to assist her future mother-in-law with fundraising. Another tie to the lifeboat was the fact that her late husband Dave was a member of the crew for many years, latterly holding the position of Second Coxswain followed by Coxswain of the Arbroath Lifeboat Inchcape. In 1993, Mary become souvenir secretary and started running the RNLI Shop at the harbour, which is a position she still holds. 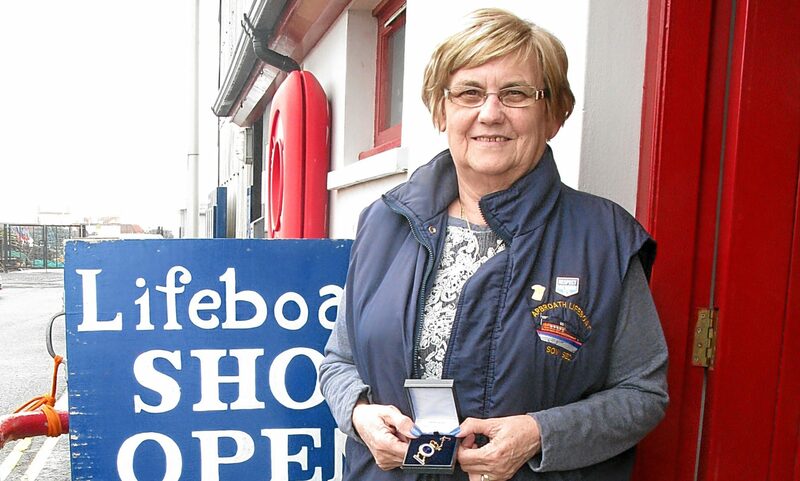 She said: “I am very grateful to the RNLI council for this honour.